Indeed the Egoista, as the vehicle has been named, is a car forged from a passion for innovation and alternative solutions, the same passion which has always set the Lamborghini brand apart. “This is a car made for one person only, to allow them to have fun and express their personality to the maximum. It is designed purely for hyper-sophisticated people who want only the most extreme and special things in the world. It represents hedonism taken to the extreme, it is a car without compromises, in a word: egoista (selfish),” De Silva further explained. The super car's debut was equally spectacular, with a cinematic entry announced by a trailer projected onto the nine big screens in the room. 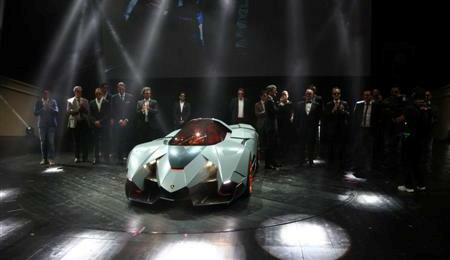 The stage was transformed into a landing strip, with a driver in a flight suit guiding the Egoista's arrival with ground crew light paddles, and the roar of the V10 engine shaking the 20-metre-tall tensioned event structure: this is the spectacle the VIP guests were treated to when Lamborghini President and CEO Stephan Winkelmann entered the Egoista, before inviting its designer, Walter De Silva, to join him on stage. The exterior is characterised by two fundamental aspects: its architecture, and the materials used. The design is determined by a highly 'muscular' structure, in which empty and solid areas fit together with strength and vigor. The bodywork is dominated, on its sides, by the pretend profile of a bull preparing to charge, its horns lowered. The bull is driving towards the front wheels, conferring a futuristic dynamism and lines which are already, in themselves, highly aggressive. Naturally, this is a homage, a bold stylistic citation which can only be a reworking of the Lamborghini brand icon, the well-known raging bull. The challenge of efficiently inserting the Lamborghini symbol as an integral part of the bodywork was met courageously and artistically. The plan view reveals a trimaran profile, where the central hull forms a unique section with the cockpit, underlined by the carbon-fibre cover on the front bonnet. The upper part of the vehicle does not have aerodynamic appendages, but rather flaps integrated in the bodywork profile which act automatically depending on the driving conditions. Two rear flaps activate automatically at high speeds to increase stability, while a series of air intakes on the back of the engine hood provides the cooling air flow to the powerful V10 power plant. While the front of the vehicle has a profile intended to increase downforce, the rear is fully open with the mechanics in view, reducing weight but also with the result of providing a more aggressive look. 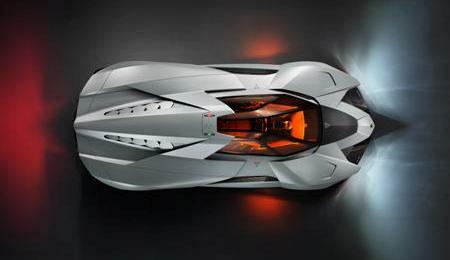 The Lamborghini Egoista's lights are more like an aircraft's than a road vehicle's. It does not have traditional headlights, rather LED clearance lights which determine its position not just on a single plane such as the road, but rather in three dimensions, as is required in airspace. Two white front lights, two red rear lights, a red flashing light in the upper part of the tail, two orange bull's eyes as side markers, and a further two lights on the roof, red on the left and green on the right, make this four-wheeled 'UFO' unique even in the dark. Finally, hidden behind the front air intakes at the base of the join between the central body and the two side sections, are two powerful xenon headlamps, two eagle's eyes able to scan the darkness for great distances. As it is made from lightweight materials such as aluminum and carbon-fiber, the vehicle has no-walk zones, duly marked like on airliners. The parallels with the world of aeronautics do not end here, however, as the body is made from a special antiradar material, and the glass is anti-glare with an orange gradation. The rims are also made from anti-radar material, flat and rough, embellished with carbon-fibre plates to improve their aerodynamics. The cabin's interior is extremely rational, its functionality taken to the extreme. There is a racing seat with a four-point seatbelt, each strip a different colour, the airbags, and the bare minimum of instruments. The focal point of these is a head-up display, typical of jet fighters. To get out of the vehicle, the driver must remove the steering wheel and rest it on the dashboard, open the dome with an electronic command, stand up in their seat, sit down on a precise point of the left-hand bodywork, then swivel their legs 180 degrees from the inside of the cabin to the outside of the vehicle. At this point they can set their feet down and stand up. 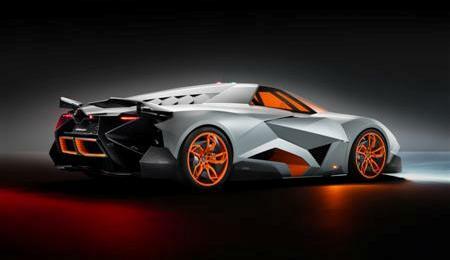 Even in getting out of the vehicle, the Lamborghini Egoista requires a pilot more than a driver. 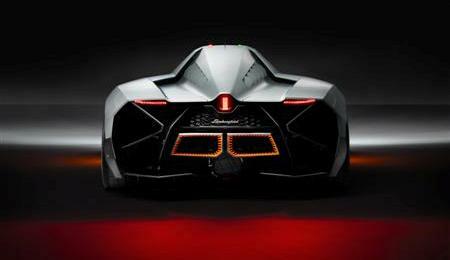 The Egoista contains, in Walter De Silva's opinion, all the product criteria which are part of Lamborghini's make-up. “It's as if Ferruccio Lamborghini were saying: I'm going to put the engine in the back, I don't want a passenger. I want it for myself, and I want it as I imagine it to be. 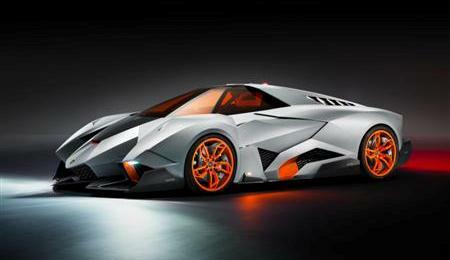 It is a fanatical vehicle, Egoista fits it well.” If Lamborghinis are cars for the few, this one goes further. It is a car for itself, a one-off gift from Lamborghini to Lamborghini.